Sometimes some dreams don’t work out, for another to come true… When Melodie Nicolle’s dream of becoming an actress was shattered, she was plunged into a period of lost and anxiety. However, it was during that time that she discovered her next true love – weaving. She quickly regained her creativity and started creating weaves that were vegan (… yes, vegan!). 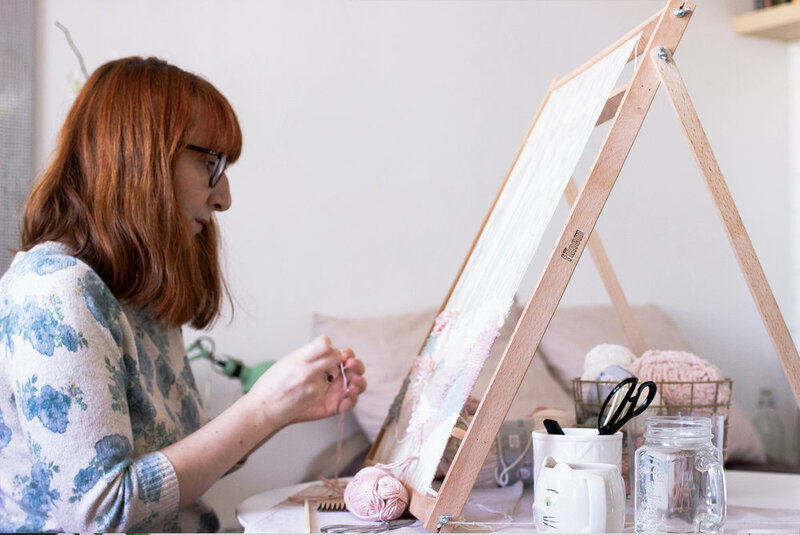 Being vegan herself, Melodie wanted to provide people an option to buy tapestries made of plant fibres. She sells her textural pieces on her Etsy shop, Happy Melodie where you can also find her handmade soy candles. We had a chat with her on how weaving has helped her come out of a dark period of her life. 1. Tell us more about your background and what led you to choosing weaving and macramé as a craft? In my teenage years and early adult life, I directed all my creative energy towards my goal of becoming an actress. Sadly it didn’t happen, and after a while I had to take on many different jobs to provide for myself. I gradually lost touch of my creativity until I had a burn out in 2015. It was a hard time for me as I developed anxiety and panic attacks, but it was also then that I felt the deep need to do something creative again, and particularly, something with my hands. I made jewelry for a while, but that wasn’t satisfying enough, and then I tried weaving on a whim and it was like love at first sight! I loved the process of weaving, the focus it gave me whilst also allowing my mind to wander for hours, and it felt so therapeutic and relaxing. I also loved the endless possibilities of that art – I saw no real boundaries in what it was possible for me to make and my imagination was just all over the place! I started back in August 2017 and haven’t stopped since. 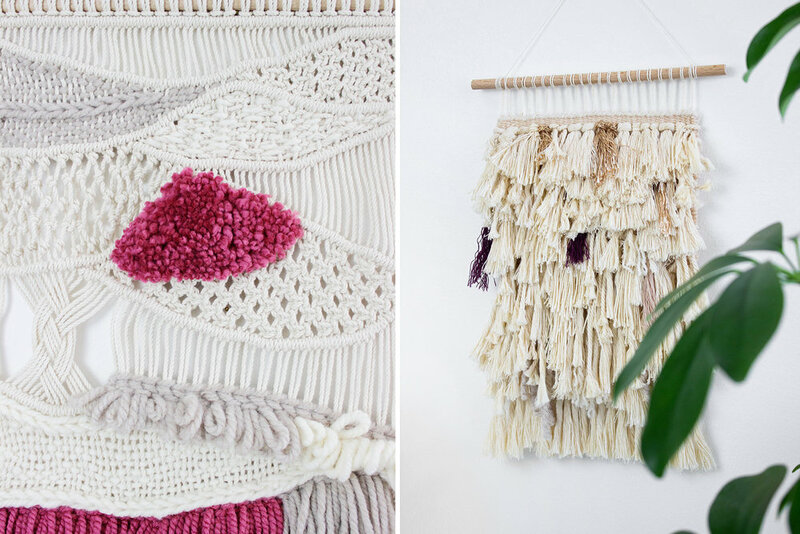 Then I picked up Macramé just a few months later and fell in love for basically the same reasons! Probably the fact that I’m vegan and therefore only offer vegan products in my shop. I initially started weaving because I wanted a tapestry for my bedroom, but couldn’t find anything vegan (they were all made with wool) so I had to make my own! I thought that the lack of option was a bit of a shame and decided to provide a vegan alternative to people who don’t want animal products in their home, but still want a stylish piece of fiber art on their wall! I’m working with lots of various fibers like cotton, linen, flax, acrylic, viscose (or bamboo), velvet, recycled materials etc. One thing I only recently understood is what inspires me the most, and that is textures. And fibers. I usually start with a ball of yarn that I like and feel drawn to, then I start to envision myself weaving it, giving it textures and shapes, matching it with different fibers and colors, and I go from there. For most pieces, I like to make little drawing sketches first. I often end up deviating from the original idea, but it gives me something to start with and helps me remember the full picture I had in mind at the beginning. The best part for me is obviously the yarn selection! The textures and colors I’m going to end up with are what will definitely set the tone of the piece. The inspiration behind this design is... Textures! For this piece, I basically wanted to make a mess! I really wanted to work on many different textures and use lots of different yarns and fibers. I envisioned a piece that people would want to touch frequently to feel all the different textures and materials, discovering something new every time they look at it or touch it! The dream store in which I would like to stock this design is... I absolutely love selling directly to people from my own shop and therefore be able to share with them myself. But my biggest dream store would probably be Anthropologie. I like to think that our styles could match and that makes me very happy! Which celebrity house can you picture your design at... Well I don’t know any celebrities enough to imagine their home, but if I was able to hang out with the person that gets this piece, I would choose Jessica Chastain! If this design made it big, I would... Stock on enough yarn and looms to make a hundred more! Though if we’re talking way bigger, I would move into my dream house in the countryside, adopt a dog (or two, or three), and build a cabin in the garden for my studio! 5. Great things take time, so how much has changed since you first started yarn crafting and where do you see it in the next five years? The fact that I’m now just finding my own style makes me incredibly excited to explore and develop new designs, techniques etc. But my main focus at the moment is to grow this small business of mine and make it a reliable source of income so that in five years, I can keep doing it all day every day! I also hope to be able to connect more with other artists and makers this year, as it feels quite lonely here in France for weavers actually! I want to meet more customers by taking part in fairs and creative events in my city. Basically, all I’m hoping for right now, is that people will like my pieces enough to buy them, and therefore allow me to keep making new things for many many years to come!